Not a make up person, but I certainly devote a lot of time to my shower schedule. Infact, I put all the time I save from the other 'getting ready chores' into my shower time. Blessed with a strong nose, I might be picky about what I use but I am certainly open to experimenting when it comes to bath and body. 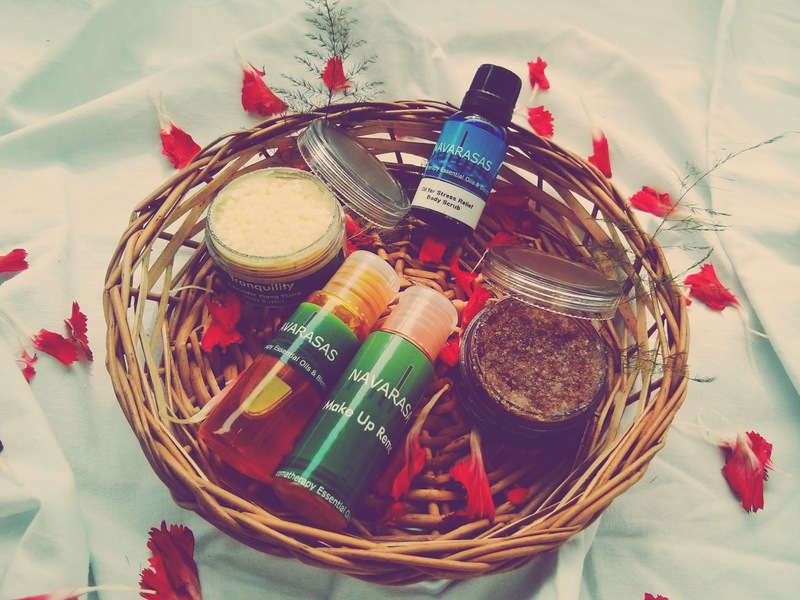 Navarasas Aromatherapy Essential Oils & Blends and reviewed them. The most striking feature is that the products are natural, with no added preservatives or chemicals. All the products are made using only those ingredients which do not contain additives of any kind. They also have pure A-grade essential oils to ensure maximum health benefits and therapeutic value of each product. is made to scrape away the stress with the healing of essential oils and aromatherapy. 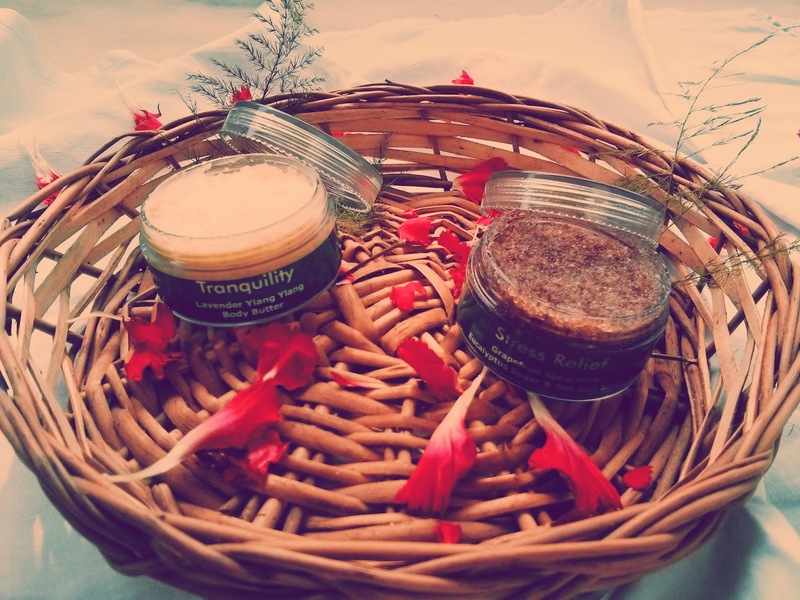 The Body Scrub has been divided into two containers to minimize the chances of leakage. Once you are ready to use it, mix the oil and the sugar sea salt together, apply onto the skin and massage for exfoliation. Wash away with water only. Do not use soap or shower gel after the body scrub, you may use it prior to the same. The skins feels lighter and healthier once you start using the product regularly. of essential oils made to sooth the the mind and heal the body. Stays on for very long and the fragrance is mild yet very refreshing. helps in reducing the dark circles. You wouldn't need a lot of the product to work on even if you apply a lot of make up. Body Oil :It is made up of Rose-hip Seed, Fractionated Coconut, Lavender, Sandalwood and Rose Essential Oil. After your shower, on damp skin, just smear a small amount of it on your body. Massage it gently over your arms and legs to ensure proper coverage. You can choose to rinse it away with some warm water or simply towel dry your skin. The product has a little too strong smell for what I prefer, even though it leaves the skin a lot more softer even after only a single use. The other staples I use are the Bath and Body works products, especially the Dark Kiss for the orgasmic (Sigh) fragrance and for the long lasting effect. The mist stays on for long as compared to the others I have tried. Well, there's a reason I have a bigger one stocked up already. The Floral Collection from Marks and Spencer captures the essence of your favorite fragrances in its bath and body range. 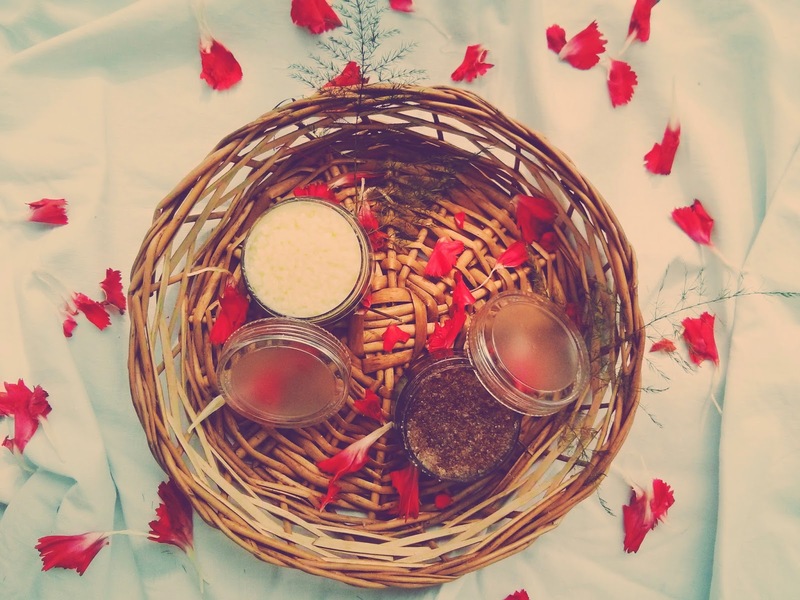 With traditional scents (Rose here) the products leave your skin cleansed, soft and delicately fragranced.